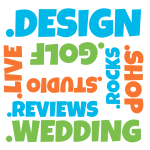 Premium domains represent broad-based business and personal categories. Previously if a person was searching for a product or service the extension would either have been .com or a country specific TLD such as co.uk. Now a user can seek a company website address (URL) using the product or service description such as .golf as the TLD. Important - Premium domains may be priced higher than standard domains, and renewal pricing can vary widely, so be sure you understand the complete terms of each domain before making a purchase.